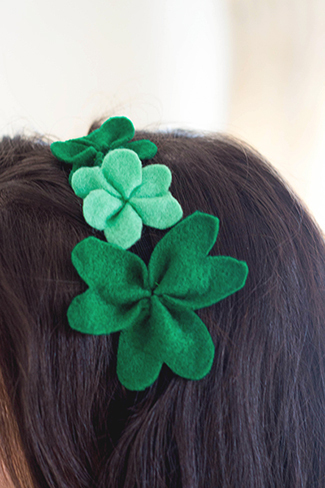 Use a marker to draw 3 shamrock leaf shapes onto the green felt. They are almost like M’s. Cut the shapes out and thread the needle with your green thread. Don’t tie a knot. Create two long stitches in each leaf and leave a gap of thread between each of them. Draw the string together on both sides until the leaves bunch together to create the shamrock shape. Tie a knot at the joining point. Attach the shamrock to the elastic or headband by using the string to tie it in place. Create a stitch in the back if you want to make it extra secure. Repeat until you have 3 shamrocks in varying colours and sizes. Fit the elastic onto your head to fit, then trim (if needed ) and secure the ends with a back stitch.